Bigleaf innovates fast, but we don’t risk your uptime to do it. Our platform is built on 3 separate layers that are fault-tolerant. The base layer, our network, is extremely reliable and is built upon tried-and-true carrier-grade technology. The middle layer, our intelligent software, is also highly reliable, but we iterate on it faster, enabling quick implementation of new traffic optimizations. The top layer providing visibility and control is built to be very reliable too, but is where we push the most updates to innovate quickly. The beauty of this design is that if an upper layer has an issue, the layers below it remain running independently and carrying your traffic. This enables us to push out new updates often without risking outages. For truly reliable Internet connectivity you need redundancy. We provide redundancy in a way that’s easy to set up and gives you peace of mind. Our core gateway cluster infrastructure has hot-standby N+1 architecture implemented at all levels for maximum uptime, and having 2 or more last-mile Internet connections gives you diversity all the way to your building. We also offer a high-availability on-site router option if you need the ultimate in redundancy. If you have high-availability (also known as “hot standby”) firewalls and/or routers then it’s understandable that you would want to keep that level of equipment redundancy when you add Bigleaf service to your Internet connectivity. We provide an option for a High-Availability on-site router setup that includes redundant routers and switches to ensure that no single piece of equipment can cause a failure of your Bigleaf service. For more details on the various risk factors to consider, and for some guidance regarding if the high-availability router option would be a good fit for your environment, please review our Risk Factors White Paper (pdf). 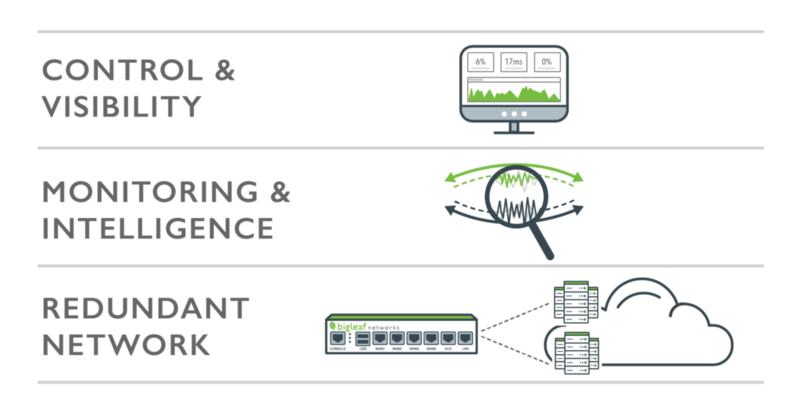 Bigleaf’s network is fully redundant, with multiple core routers, servers, internet transit circuits, and core backbone circuits. All of our POPs connect across our dedicated backbone, so traffic between Bigleaf customer sites never hits the open internet unprotected. Beyond the core network, each Bigleaf customer-premises router connects to multiple Bigleaf POPs at all times, for automatic geographic redundancy. Our philosophy is that any datacenter can fail (e.g. due to fire), so customers shouldn’t experience outages when that happens. Can Bigleaf be trusted with sensitive traffic? As you think about our Cloud Access Network and how it relates to the routing of your applications, you probably realize the trust you are placing in us. We take that responsibility very seriously. Our charge is not just to build a network reliable enough to meet your needs, but rather to exceed your expectations. The reliability of our network is a byproduct of purpose-built design and operation. Beyond the equipment, we have a seasoned team of professionals dedicated to protecting your experience. Our software and network are built to work in harmony – the network was designed to support the software and the software was built to augment the network. This provides higher availability than other solutions that mash together telco networks with generic SD-WAN software. Because we own the routers and control the network, our support engineers can optimize application performance in real time. Unlike cloud-hosted SD-WAN platforms, we don’t have to open tickets with third-party providers to make network changes. We take ownership of customer issues rather than pointing fingers at others..